The Fraser Fir Christmas Tree is the most popular type of Christmas Tree. 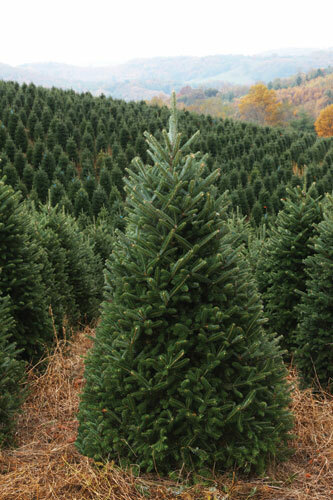 North Carolina Christmas Tree Farms produce over 50 million Fraser Fir Christmas Trees each year. The Fraser Fir grows naturally only in the southern Appalachian Mountains above 3,000 feet, making Kathy Shore Nursery in Sparta, North Carolina a perfect location for these majestic trees. The cool temperatures and natural rainfall common in the Blue Ridge Mountains are ideal growing conditions. The Fraser Fir Christmas Tree is a uniformly pyramid-shaped tree which can reach a maximum height of nearly 80 feet. The combination of form, needle retention, dark blue-green color, pleasant scent, and shipping characteristics have all let to the Fraser Fir Christmas Tree being a most popular species of Christmas tree. Kathy Shore Nursery takes great care when it comes to growing the beautiful Fraser Fir Christmas Trees for which they are known and offers Wholesale Christmas Trees. Each Fraser Fir Tree, whether it be a Table Top Christmas Tree, or a full size tree for the home, is maintained carefully throughout its time at Kathy Shore Nursery. Kathy Shore takes incredible care of each tree from the time it is a seedling until the time it is harvested. Kathy Shore Nursery will even palletize your Wholesale Christmas Tree order, saving your business time and money. Kathy Shore Nursery's dedication to excellence and commitment to value make them the best choice for ordering Christmas Trees Wholesale North Carolina. For more information our Wholesale Christmas Trees, shipping options, fundraising and setting up your very own lot, or our other greenery products, call Kathy Shore Nursery today!